gift vouchers are a unique present that every man will appreciate. Corporate gift solutions are also available as a way of thanking business associates or praising hardworking staff. Purchase a gift voucher online and have it sent directly to the recipient. Simply fill out the form below with your details, and those of the recipient, and enclose a special message to be included. 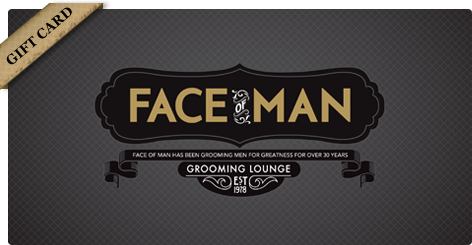 Choose this option if you wish to have the voucher posted out from Face of Man in a beautifully presented gift bag. Gift vouchers will not be exchanged for cash or a refund. Gift vouchers cannot be redeemed for skin care products. Gift vouchers cannot be used with other complimentary gift cards, such as our $25 Gift card. All vouchers purchased after 1pm will be mailed out the following day. Please note this is not next day delivery guaranteed. There is a $5.50 charge for postage. Gift cards cannot be cancelled. We do honour all gift cards after the six months’ expiration, but these treatments can only happen between Monday and Friday, 9am to 3pm. Appointments made under a gift voucher cannot be cancelled within 48 hours of the scheduled appointment time.